By the end of the 1960's, the Soviet political and state authorities had a very serious problem of feeding its citizens. The Soviet Union belonged then to the world?s biggest food importers. The ways to remedy the situation and increase food production had to be found. One of the solutions was the development of agricultural aviation. A quick decision of supplementing and later the entire replacement of the agricultural An-2's was made. Condition of the significant increasing of the chemicals payload as well as the unification of fuel for the both, civil and military aircraft was placed. Being one of the licensed multipurpose An-2's, the An-2 agricultural aircraft, fulfilled its duties. However it was considered obsolete, due to its piston engine. In 1972, in the Soviet Union, the initial study works, established the new agricultural aircraft concept. Poland was included into the project. Designer's R.A.Ismailov's initial design was considered as the most promising. It considered the use of the twin flow Ai-25 turbojet engine to power the aircraft. Such an engine was popular, both in civil and military aviation. The Ai-25 was use to power the Soviet Yak-40 executive jet, and the school and training Czechoslovak L-39 Albatros. Wide service knowledge of this aircraft engine had to make its servicing in the future easier. The lower economical servicing costs also favoured this type of engine to the piston type. Yet the approved concept of the aircraft was strongly criticised by Soviet agriculture aviation specialists. Their opinion was underestimated by the Soviet Aviation Industry Ministry. In December 1971, the agreement with Poland was signed on co-operation with designing the M-15 new agricultural aircraft. The work had to be done by joint Polish - Soviet design teams, working at Mielec, Poland. The team was led by the main design consultant R.A. Ismailov, while Poland was represented by key designer Karol Gocyła. The initial work started in spring 1971. The aircraft was designed as a biplane. The engine was placed over the short fuselage and under the upper wing. It aimed at securing the engine on ground, against stones and other objects causing its faster wearing. Two hoppers were placed on both sides of the fuselage, between the wings. The airframe had twin booms ending with two vertical stabilisers, connected with a horizontal stabiliser. Such a fuselage configuration allowed for a free flow of exhaust gasses and didn't disrupt swath. In front, a sealed cockpit, enabling excellent visibility and protection against chemicals was placed. Behind the pilot's cockpit, there was a compartment for two technical service men. At the rear of the fuselage a starting unit was placed. The aircraft had a fixed nose wheel undercarriage. The wings were equipped with ailerons and flaps, improving flight characteristics. The lower wing served as the fairing for the spraying installation. Aimed at the confirmation of the correctness of the assumptions of new agriculture, the "flying laboratory" was built. 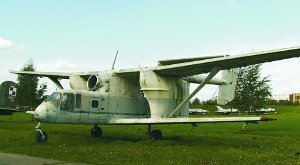 It was a rebuilt An-2 (chosen because of the configuration similarity), named the Lala-1. The pace of work was fast and in the spring 1972, the mock-up was ready. To speed up the work on the prototype, the wings and undercarriage from the Soviet An-14 aircraft were used. By the end of May 1973, the LLM-15 (flying laboratory M-15) started test flights. The M-15 prototype was flown in January 1975. On the next prototypes, the air exhaust was shortened and the shape of the hoppers, containing 2200kg of chemicals, was changed. The same changes were done on the information series, manufactured in 1975. In between time, the school version (with a cockpit for pupil and instructor) was worked out. Other versions of the aircraft were also envisaged. After operating tests, in 1976 serial production started. In 1977, the M-15 was presented at the Paris Air Show. The M-15 appeared to be very expensive in production and operation. Its servicing in the Soviet Union brought big disappointment. The aircraft was strongly criticised by its users. In 1974, the Soviet Union stopped further M-15 orders, which led to stopping its production. By that time, 175 M-15 aircraft were produced.